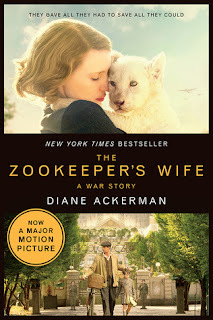 The Zookeeper's Wife is a moving story about a family who ran a zoo in Poland in the late 30's and early 40's. The novel is formed by historical evidence, interviews, and the main character's journal. It is a touching and heartbreaking war story about a family who risk everything to help save other's lives. The story of Antonina, Jan, and their zoo is an incredibly interesting tale about the ups and downs they faced throughout their lives. What started out as a joyous life at the zoo ends in turmoil and danger when they begin harboring and evacuating Jews through their home. The writing was a bit slow and jumpy, and I found that Ackerman used unnecessary amounts of detail that left me a little bored from time to time. I think the movie adaptation will be far better than the book because the minor details will hopefully be left out. Antonina and Jan's story is a different take on the holocaust. While it was a true and heartbreaking story, I had difficult time diving into it because of the writing style. I think the actual story is interesting and will make a touching movie. I look forward to the movie, but I can't say I really loved the book.